How to identify a good espresso? During the last week I ordered many different espresso shots at coffee shops around the place where I work - some cheap, some expensive, some chains, some independent stores. As I heard that it is difficult to make a good espresso, I wasn't surprised that there were major differences in the outcome: While some where really watery and thin, others were pretty oily and thick. Of course, I also enjoyed some more than others. That takes me to the question: How do I identify a good espresso? Are there any general "guidelines" on how an espresso should taste/smell? How should it be consistency wise? 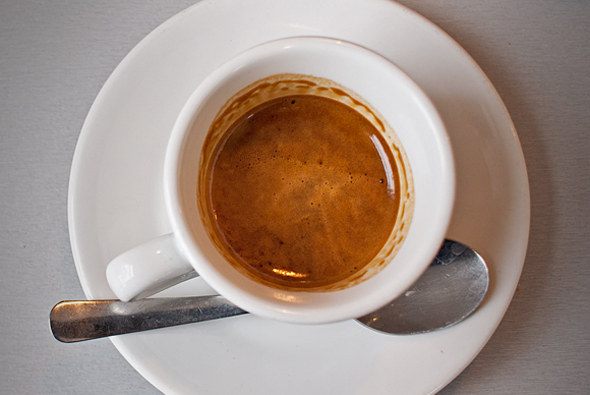 The standard espresso drink is the double espresso (a double espresso shot). Although you can get single or triple espressos, if you are comparing quality, the double espresso is the standard. Regardless of which type of shot you order, if you are comparing quality across different cafes, you should always order the same thing (ie don't order a single at one cafe and a double at another). Once again for standardization, I would recommend ordering a double at each one. My explanation of good espresso will be about straight espresso (no milk, no sugar) in an espresso mug/cup. The espresso should be quite hot when served. If it is only lukewarm or warm right after it is made, then the barista did not heat the cup that it was served in. It should be to the temperature where it is too hot to drink (for most people). It should only take a minute or so to cool off. Perhaps two minutes. There should be a nice layer of crema on top of the espresso (a few millimeters thick, completely covering the espresso). This comes from the release of carbon dioxide when the espresso is extracted under pressure. The color should be golden-brown to dark brown for a double shot. The color will not always be uniform, it will sometimes be slightly lighter where the shot actually poured in the spot on the crema. The crema should remain for at least three - five minutes if not longer. The espresso should be bitter, but not too bitter (high levels of bitterness are more characteristic of espresso long shots). It should be rich, but not too rich (again, high levels of richness are more characteristic of espresso ristretto shots). It should NOT be sour. If it is sour, it has been sitting for too long before being served or was over-extracted. It should not taste watery, this is usually a characteristic of under-extraction. Hard to describe for espresso and the aroma will vary a lot. One thing to avoid is a 'sour' smell, which usually indicates a sour taste, as described above, or that the coffee being used is inherently too acidic. Espresso is going to be thicker and more viscous than regular drip coffee, but it won't be syrupy. When you are done your espresso, the drop or two that remain at the bottom of the cup, when dried should leave a distinct brown residue on the bottom of the cup. You will have to remember that different cafes will use different varieties of beans for making espresso, so this is going to affect the flavor. Different cafes use different amounts of ground espresso and different amounts of water when preparing their espresso. The industry standard is 2 oz (about 60 milliliters) for a double shot, but in my cafe we do our double shots to 3 oz. Most importantly, learning to recognize good espresso is an experienced based endeavor, just like with wine, beer, or food. On a personal note, I love to do this with cafes as well! I always judge the quality of a cafes espresso and ability by ordering my favorite drink: a double espresso long. In fact, I am going to a new cafe to do it today!! I evaluate espresso based on the taste, aroma, and body/mouthfeel. There are no guidelines for espresso taste and aroma. You can find many different notes in cofee, and many people prefer some styles of coffee to others. That being said there is a standard for the mouthfeel: full-bodied, round and smooth; A good espresso should coat your tongue like condensed milk. Most of the taste is going to come from the beans used. Finding a roaster that you like is the most important thing to drinking consistently good tasting espresso. Ask your barista who roasts their beans next time you find yourself enjoying a cup. Knowing the best practices for espresso preparation can help you to evaluate if it is being prepared correctly. The preparation will affect the taste of the final espresso and also the mouth feel. Make sure the coffee is being ground fresh just before preparation. You should hear the grinder running every time a coffee is made. Using coffee ground more than a minute before preparation leads to stale tasting coffee, may taste flat, bland, stale. When tamping the espresso, look for a consistent and clean tamping process. The final puck of coffee should be uniform, flat and smooth. Not tamping properly leads to uneven extraction. Watch the barista and see if he makes it look easy, but delicate. If you can see the machine, watch the pour. Ideally it should come out slow and thick, if it pours but starts dripping halfway to the cup the consistency is good. If it comes out too fast you will get a thin and under extracted cup. The extraction should last about 30 seconds. Over extraction will cause the body to be watered down and will likely taste bitter or burnt. Once the espresso has been made, that a server brings it to you as soon as possible. Make sure the coffee roast is not too fresh or too old. Usually 10-20 days after roast is ideal. Otherwise stale coffee. Machine is regularly serviced and cleaned. How do espresso machines hold pressure at all? Hot espresso poured into a cold cup - is that dangerous?